Our ASQ® experts get a lot of questions from program administrators and staff about screening premature children. And we’re glad they ask! To accurately check whether a child is reaching developmental milestones, it’s important to account for any factors that may impact screening results. In children who are born prematurely, chronological age is not always the best indicator of where the child should be developmentally. When is a child considered premature? A child is considered premature if he or she is born three or more weeks before the estimated due date. The ASQ developers used 39 weeks as full-term pregnancy in their research and data analyses. Some hospitals and other screening programs use 38 or 40 weeks as the full gestational period, which is also fine. Consistency is key. At-a-glance reference for using ASQ with premature children. What do I need to do before screening a child who was born prematurely? If a child is younger than 2 years of age, you should always adjust the child’s age. 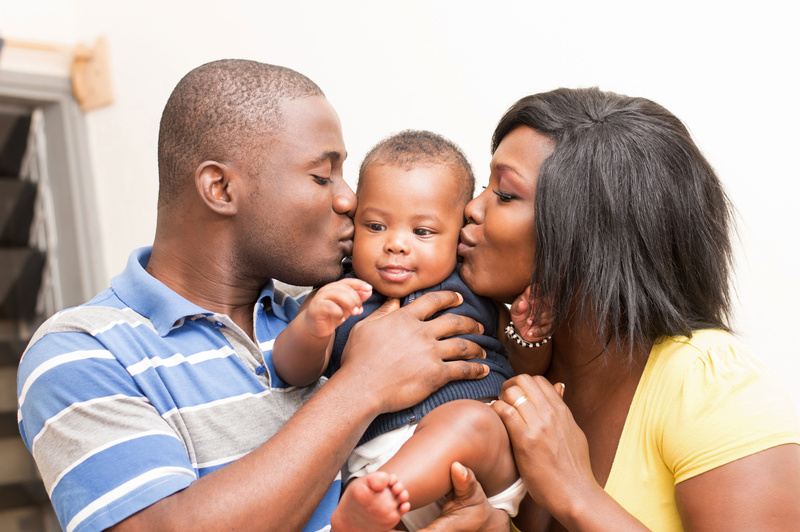 Both the ASQ®-3 and ASQ®:SE-2 require you to adjust the child’s age to account for prematurity. Why is it necessary to adjust a child’s age? Children who are born early may take longer to reach some milestones than children born closer to their due dates, so lumping all kids of an age range together may result in unnecessary referrals due to concerns that are actually a result of prematurity. Cutoff scores were established using children whose ages were adjusted for prematurity, so you must use the adjusted age to choose the correct questionnaire interval for both ASQ-3 and ASQ:SE-2. When should I adjust a child’s age? Adjust a child’s age only if he or she is 3 or more weeks premature. This means a child born at or before 36 weeks should have his or her age adjusted. Age should only be adjusted for children under age 2. Once a child is 2 or older, prematurity no longer needs to be considered and the actual age should be used. How do I adjust a child’s age for ASQ-3 and ASQ:SE-2? 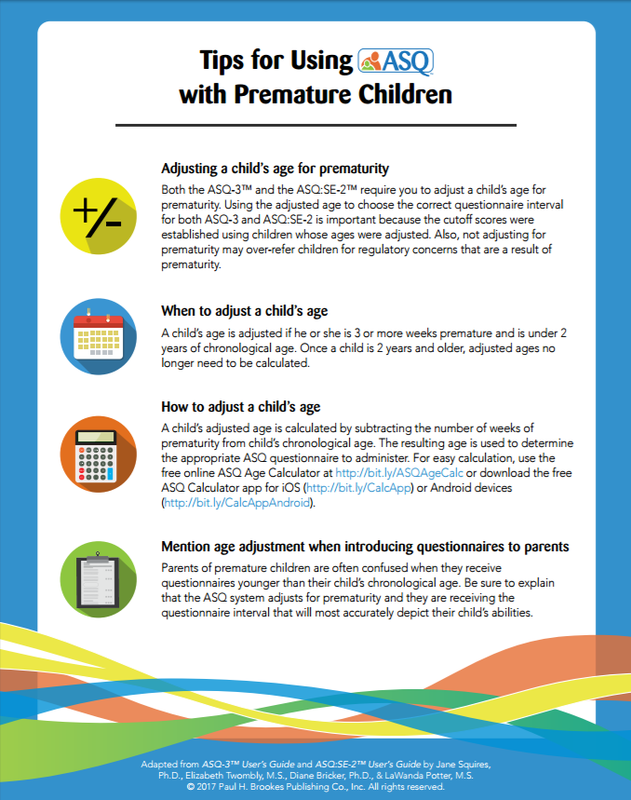 Calculating adjusted age is the same for both screening tools: Subtract the number of weeks of prematurity from the child’s chronological age, then use this number to determine the appropriate ASQ questionnaire to administer. Use one of our free tools to be sure you have correctly adjusted age for prematurity. Simply enter the administration date, birth date, and weeks premature and the tools will give you chronological and adjusted ages, as well as which questionnaire to use. You can also calculate chronological age by hand. The example below uses simple subtraction to calculate an exact age of 1 year, 4 months, 5 days. Then subtract the number of weeks of prematurity from the chronological age. Confirm your questionnaire is in the correct range by checking the age range listed at the top of the family information sheet and the first questionnaire page. How should I introduce ASQ to the parents of premature children? Parents of premature children may be confused when they receive questionnaires for an age range that is younger than their child’s chronological age. When you provide the questionnaire, be sure to explain that the ASQ system adjusts for prematurity and that they are receiving the questionnaire interval that most accurately depicts the developmental milestones appropriate for their child. Read more tips on effectively introducing ASQ questionnaires to families. The ASQ User’s Guides have more information on screening children who are born prematurely. In the ASQ-3 guide, see pages 65–66. In the ASQ:SE-2 guide, see pages 65–66 and 86–87.